Jerseys can be expensive, so here are some alternatives. 1. This Argentina t-shirt with some of the team's top players (yes even if Messi misses a penalty, he's still one of the top players), is perfect for any "Albiceleste" fans. You can get it from The G.O.A.T.S Apparel on Etsy starting at $22. 2. If you're supporting Australia this World Cup, you can get this customizable t-shirt to get into the football spirit. You can get it from SportsPlusExpress on Etsy starting at $9.99. 3. If you're rooting for the ~Red Devils,~ who also happen to be one of the favorites this World Cup, but don't want to commit to the official jersey, this cute t-shirt will do the trick. You can it from FCliga on Etsy for $9.59. 4. Though Brazil is also considered one of the favorites, getting a t-shirt with a legend's name on it might be the safest bet after what happened in 2014. You can get it from SportsPlusExpress on Etsy starting at $24.99. 5. 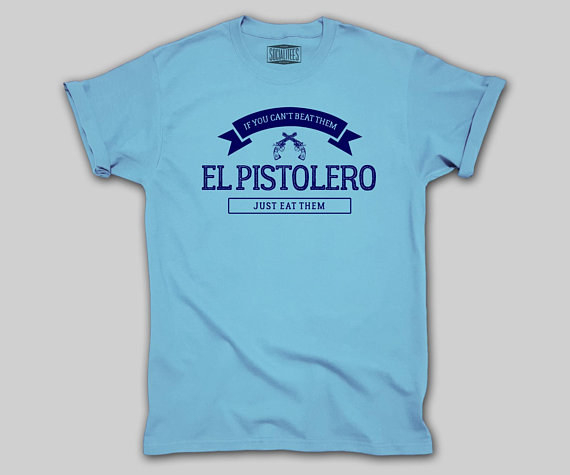 If you want to show love for "Los Cafeteros," while educating people at the same time, this shirt is for you. Get it from Teepublic for $20 (available in 23 colors). 6. Costa Ricans did well last World Cup, but that doesn't mean you can justify spending $84.99 on a jersey. If you're on a budget but still want to show your support, you can do so with a t-shirt like this one. You can get it from FCliga on Etsy for $9.59. 7. Croatia started off the World Cup with a win, so if that makes you want to show your team off, this t-shirt will help you with that. You can get it from UNI7ED on Etsy for $17.97. 8. Denmark also started the World Cup right, by winning their first match. Get this t-shirt if you think the Danes have a shot at winning everything. Get it from UNI7ED on Etsy for $20.97. 9. Even though Mo Salah is still recovering from his Champions League injury, he'll most likely be playing for Egypt's next game. Get this shirt if you're a Mo Salah and Egypt fan. You can get it from PopSportDesigns on Etsy starting at $19.99. 10. England hasn't won a World Cup title since 1966, but if you have faith in the current team, this t-shirt should be in your shopping cart. Get it from AllaboutshirtsShop on Etsy for $12.28. 11. If you think "Les Bleus" are taking the cup home, this cropped tee should be part of your wardrobe this summer. Get it from UNI7ED on Etsy for $21.97. 12. Germany, the current champs, have a ton of fans who would look great wearing this Deutschland t-shirt. Get it from UNI7ED on Etsy starting at $17.97. 13. Iceland shocked people by tying with Argentina in their World Cup debut. If you're impressed and want to show the team love, this cute t-shirt is perfect for you. Get it from UNI7ED on Etsy for $25.97. 14. If you're a fan of Iran's team solely because you think they're hot, I'm not here to judge. Also, here's a t-shirt so you can pretend you care about football too. You can get it from Flag Outfitters on Etsy starting at $32.50. 15. Are you supporting the "Blue Samurai," but don't want to spend over $30 doing so? I got you. This ~football~ t-shirt is under $25. Get it from ZiddTees on Etsy starting at $20.99. 16. If you're into minimalist design and Korean football, this shirt is a perfect mix of both. Get it from Tasdorb on Etsy for $13.08. 17. Mexico's fans are so committed to their team, that after their win over Germany, they literally created a mini earthquake. If you're shook by how well they played, and want to show your support, get this t-shirt in your shopping cart ASAP. Get it from FCliga on Etsy for $9.59. 18. The "Lions of the Atlas" is a sweet nickname for a football team. If you feel the same way and want to make your love for Morocco known, get this shirt. Get it from Morocco Soccer on Etsy for $21.99. 19. Though Nigeria has one of the coolest soccer kits ever, not everyone can spend over $80 on something they'll only wear a few times. So this t-shirt is for you. Get it from FCliga on Etsy for $12.34. 20. Panama is making their World Cup debut this year, and if you're excited about it, you can show your love by wearing this t-shirt. 21. It's the first time Peru is playing the World Cup since 1982, so if that's not reason to celebrate, I don't know what is. Get this t-shirt to show your support. Get it from ThreadsforHeadsNJ on Etsy starting at $15. 22. If you're rooting for Poland, get this chill, yet very Polish t-shirt. Get it from UP W!TS CREEK on Etsy for $19.85. 23. If you think Cristiano Ronaldo is bae, but you're also into how talented he is, show your man support with this Portugal t-shirt. 24. If you're rooting for the host nation, but don't feel like committing to an actual jersey, this Russian t-shirt is the perfect find for you. 25. Saudi Arabia had an upsetting loss against Russia at the World Cup opening game, but if you're a loyal fan and will stand by your team no matter what, you should consider getting this t-shirt. 26. Senegal reached quarter-finals in 2002, and now they're back for more. Rep your team with this colorful t-shirt. Get it from ThreadsforHeadsNJ on Etsy for $15. 27. This Serbia t-shirt looks almost exactly like the official jersey, but it's way, way more affordable. You can get it from AllaboutshirtsShop on Etsy for $12.28. 28. Spain is another favorite this year. Get this t-shirt if you want to bet for a team that will probably go far in the tournament. Get this shirt from UNI7ED on Etsy starting at $10.99. 29. Sweden might be missing Zlatan this World Cup, but they might not need him after all. Show your love for the Swedes with this cotton t-shirt. Get it from Bonafide Icon on Etsy for $16.99. 30. Switzerland will most likely make it out of the group stage, so show some love with this football-friendly t-shirt. Get it from KNUXX on Etsy starting at $19.99. 31. This ~retro~ Tunisian t-shirt is a great alternative to an expensive football jersey. Get it from FCliga on Etsy for $9.57. 32. 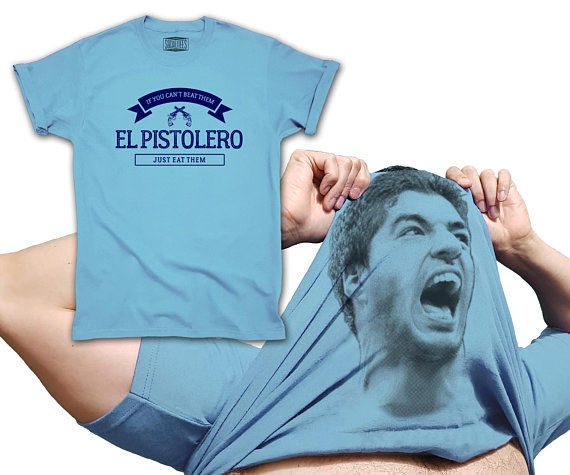 Suarez might've made headlines last World Cup for biting someone, but this time around he's ready to win. This t-shirt is a fun way to celebrate the goals he'll probably score. Get it from Socialitees on Etsy starting at $18.99.